Joseph Ricardo Fernandez was sentenced to three years in state prison today for the hit-and-run death of Encino ultra-distance cyclist Jim Swarzman last April. As you may recall, Swarzman was riding along Highway 101 in the Leucadia neighborhood of Encinitas with his fiancé and another man when he was hit by a truck driven by Fernandez. Actually, hit is a mild term; his fiancé, Nicole Honda described the collision as an explosion as she watched Swarzman fly past her through the air, while the driver continued down the highway without even slowing down. Fernandez turned himself in a day later, reportedly telling police investigators he thought he might have hit something over the weekend. Though how you manage to hit someone with that much force without knowing it will forever be beyond me. After Fernandez waived his right to a jury trial, he was convicted of felony hit-and-run causing death in a two-day bench trial conducted by Vista Judge K. Michael Kirkman, facing a possible four years in prison. Three years for plowing down another human being and leaving him in the street to die. Although I suppose we should be grateful the Fernandez got any time at all. I’m glad he was sentenced for his crime, even if he did get less than the maximum sentence. But this is one time when the time does not fit the crime. Maybe now that the trial is over, we can finally find out why Fernandez only faced charges for hit-and-run, rather than being charged with actually causing Swarzman’s death. And if the rumors are true about the judge blaming Jim Swarzman for improper lane positioning, in what would seem to be a basic misunderstanding of bike law. Update: San Diego’s 10News reports that Fernandez was sentenced to just two years in prison, rather than three. No explanation yet on the discrepancy. If you’re not doing anything tonight, drop by the Pitfire Pizza at 108 W. 2nd Street in Downtown Los Angeles at 7pm. And help set the agenda for cycling in the City of Angels. Because, as of this month, I’m taking over for Stephen Villavaso as Chair of the LACBC’s Planning Committee. Stephen’s done a great job in chairing the committee. Quite frankly, I would be just as happy, if not happier, if he’d been able to continue in the role. And I want to thank him for all the hard work he’s done as Chair, and hope he’ll continue to offer his invaluable insights as a member of the Planning Committee. However, any change in leadership provides an ideal opportunity to rethink the role of the committee, as well as the projects and policies we want to pursue. As a result, the primary topic of this month’s meeting will be a discussion of exactly what the Planning Committee is, and what you’d like to see come under its heading. I hope to conclude the meeting with a clear agreement on the role and future direction of this committee. In addition, I’d like to begin a discussion of the programs and policies we want to support on a state and local level. This doesn’t have to be limited to anything that is currently under discussion within the LACBC or anywhere else. Use your imagination to come up with solutions that could make bicycling better, safer and/or more enjoyable for bike riders in California, L.A. County, or in your own neighborhood and the areas you ride. I have my own ideas. But I really want to hear your thoughts as we shape an agenda for the months to come. I’d like to personally invite everyone to attend. 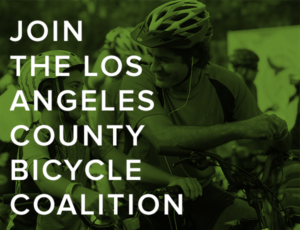 You don’t have to be a member of the Planning committee, or even a member of the LACBC. 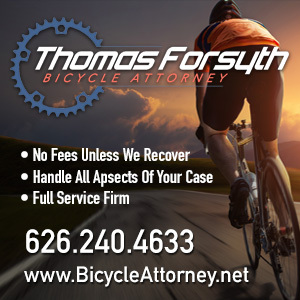 If you ride a bike in Southern California, or care about those who do, we want to hear from you. Because the more voices we hear from, the better our work will reflect the attitudes and desires of the local riding community. You didn’t encounter a shitstorm of criticism because you expressed your opinion about L.A.’s bicyclist anti-harassment ordinance. You were deservedly taken to task because you blatantly misrepresented the new law. 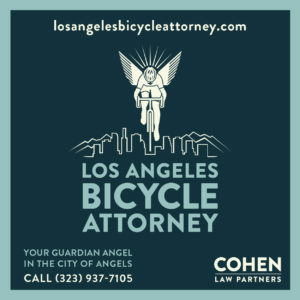 Attorney Bill Blum may or may not make some valid points in his Op-Ed in the L.A. Daily News — though you’d think any lawyer worth his salt would know that neither drivers or cyclists are a protected class under the Equal Protection Clause. Let alone that the laws regarding cyclists and drivers are not, and were never intended to be, symmetrical in their application to each. The courts have long accepted that drivers can be required to have a license —which can be taken away — because of the threat their vehicles pose to everyone else on the streets. On the other hand, cyclists don’t require a license precisely because we pose so little risk to those around us. So much for the courts requiring that both be treated equally. Yes, we may piss you off. But the biggest risk most drivers face from cyclists is that we may get a little blood on your paint when you run us over. I’m facing a busy work load this week — the first time in months I’ve had as much, if not more, paying work on my plate as I can handle. So let me offer my apologies in advance if I don’t manage to post as much or as often as usual. Besides, I’ve got a committee to chair. On the other hand, that makes it a perfect opportunity to submit a guest post of your own. 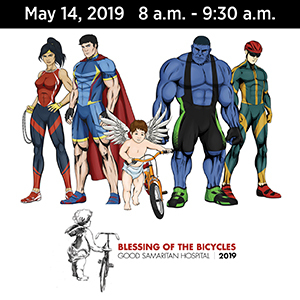 So if you have anything you’d like to say on any subject directly or indirectly related to bicycling, just drop me a line at bikinginla at hotmail dot com. Whether you agree with me or not. And yes, that includes Mr. Romero. I hope that your committie can somehow find a way to encourage Law Enforcement Agencies and Officer to write citations for violations of the “3 Foot Law.” In the eight years that my state has had the “3 Foot Law,” I am not aware of a single citation that has been written, by any Law Enforcement Officer, to enforce it. Unenforced laws, sometimes called “Feel Good Laws,” provide no protection to or for anyone, and are a bane on civilazation. I can’t speak for other jurisdictions, but I’m confident that the LAPD and Santa Monica police will enforce it, based on recent conversations. But we still need to hold our breath until the Governor decides whether or not to sign it. But you’re right about enforcement. Just look at the failure of the hand-held cell phone ban — which Brown inexplicably refused to strengthen. Can’t make it to the committee meeting, but please keep us informed of how things are going. I would like to see designated bike routes, so someone doesn’t have to pull out a map to traverse the city. Just as we have the Marvin Braude bike path, perhaps if we had routes from north LA to the port, and East LA to the west side, it could help provide focus to bikeway improvements. The routes could be a combination of Class 1, 2 or 3 bikeways with signage and mile markers and direction finding. Great suggestion. I think that should be a key step in implementing the new bike plan. There are conflicting reports about the Fernandez’ sentence. Some news sources are saying he got 3 years, others, 2 years. Very strange. I only linked to one source last night, but I found two others that said he got three years. Either one or more is mistaken, or there’s something odd about the sentence. According to the San Diego County Sheriff’s office, Fernandez was remanded yesterday, and has another appearance before a judge on October 3rd. His conviction is for violation of CPC 20001 (b)(2), which is an acknowledgement that death or “permanant, serious injury” was involved in the crime. I called the North County Superior Courthouse directly and was told that the case is still “out.” This was “clarified” by the clerk who explained that they had not yet received the paperwork to be filed, although she did confirm that the defendant was in the courtroom yesterday and has an upcoming court date.